Pure Life Purified Water NLE068274611995 $12.54 Purified water offers a refreshingly light feel and flowing texture for a great tasting way to stay hydrated throughout your day. It starts with an advanced production process that's carried out under strict hygiene conditions and then filtered through a 12 step quality process to provide a crisp, delicious taste. And to ensure the taste is consistently smooth, a unique blend of minerals is added for incredibly pure tasting water. 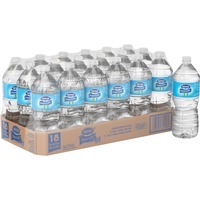 Bottled water is perfect for keeping in breakrooms, reception areas, kitchens and more.